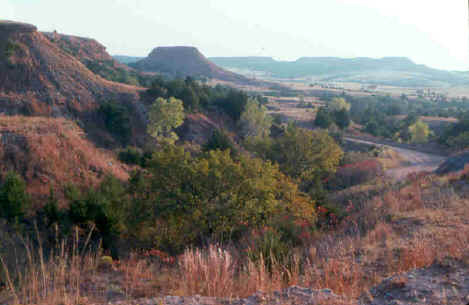 The Gypsum Hills Scenic Byway is approximately 42 miles in length and extends from the western city limits of Medicine Lodge to the junction of U.S. 160 and U.S. 183 at Coldwater. It bisects the beautiful Gypsum Hills. Travelers have the opportunity to see flat mesas, deep canyons, sharp high hills, red soils and caprock formations. The Byway provides a unique opportunity to experience the expansive High Plains and Red Hills physiographic regions. Both topography and vegetation change between the two regions. From rolling farm land and midgrass prairie grazing land to the rugged, gypsum-capped flower pot shale mesas and buttes with minimal vegetation, the Gypsum Hills Scenic Byway showcases two of the Kansas' most picturesque landscapes. The area is noted for its abundance of wildflowers in spring and summer. Naturally flowing springs, the red soil and green cedar trees provide a rich array of color. Recreational and historic opportunities complement the scenic experiences. Medicine Lodge is site of the Indian Peace Treaty and Celebration held every three years. Fishing, boating, swimming, hunting, bird watching, hiking, trail riding, backpacking and spelunking activities are available along the route. Wildlife are abundant as well - deer, turkey, quail, pheasant, raccoons, skunks, beaver, bobcats, porcupine and the occasional armadillo. When road conditions permit, the Gypsum Hills Wildlife Drive is a good way to see the back-country here. Lake Coldwater, at the west end of the Byway, is a good spot to stop and visit for wildlife viewing. 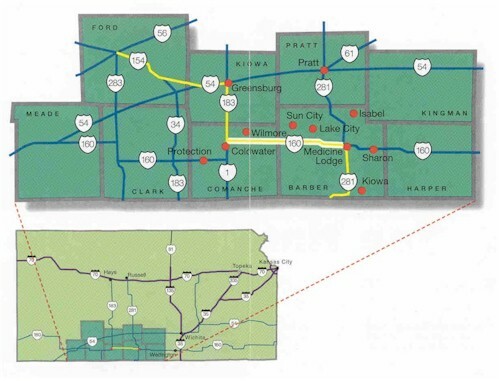 Download the brochure for the Gypsum Hills Scenic Byway by clicking here.